The past few weeks have been a whirlwind for me, and things are only ramping up! If you have not picked up on it already, I am getting married in early September, so with relatives visiting from overseas, and lots of wedding crafts to do, while still working full time, I’ve had my plate full! Which explains the lack of posts! To help my sanity I will be stepping away for the next few weeks to focus on family and fully enjoying this important moment in my life. I will be back in mid to late September with lots of wedding DIY’s to share! 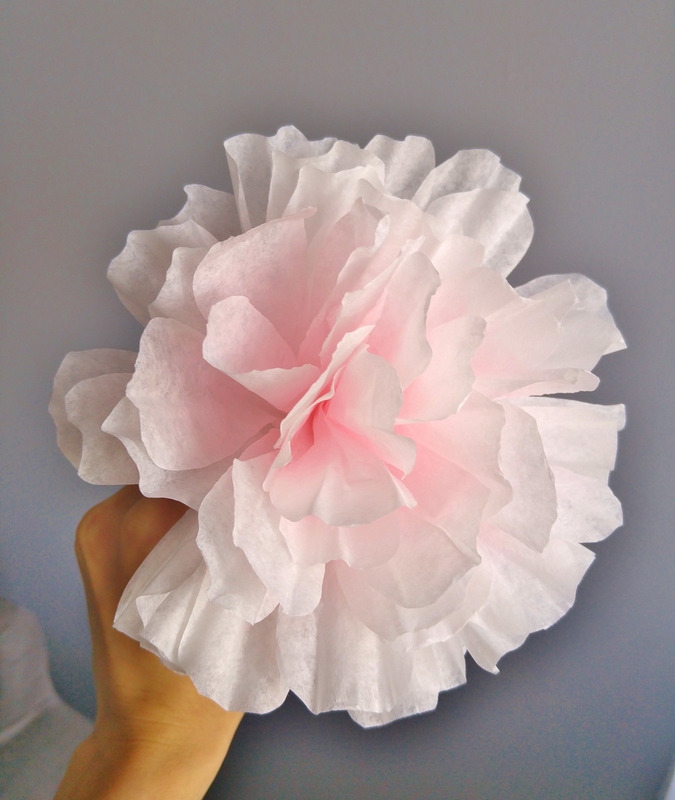 In the spirit of upcycling and crafting with thrifty materials, I give you: Coffee Filter Flowers! I hear you, these guys are all over Pinterest. 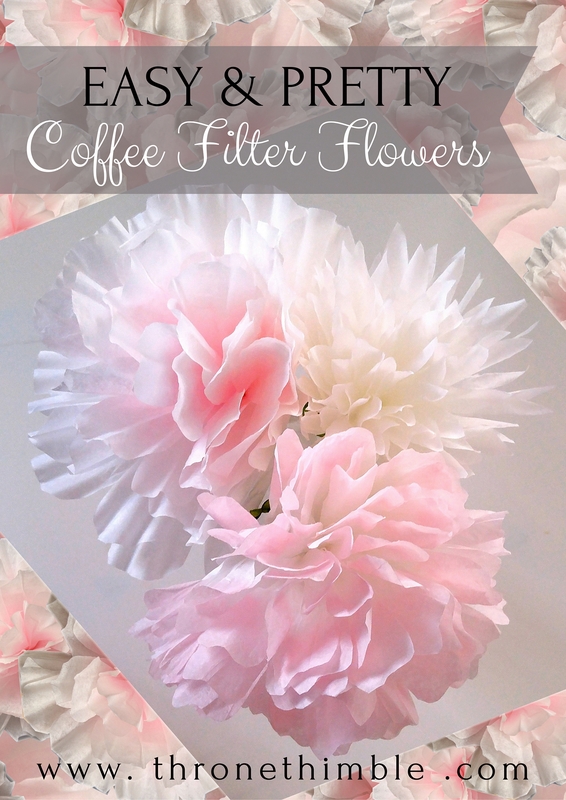 These coffee filter flowers range from super realistic and intricate roses, all the way to simplistic hydrangea-like puff balls. This is a middle ground: super easy and quick, but still gives you great flexibility to create a variety of pretty flowers! 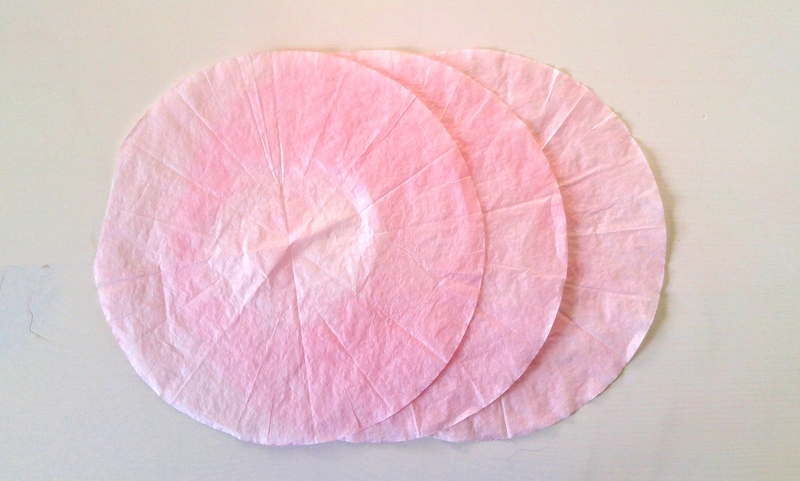 You can absolutely leave your coffee filters flowers white, but I like dip-dyeing the filters beforehand in watercolors to create a beautiful ombre effect. Alternatively, you could also use food coloring, or diluted acrylic paint. 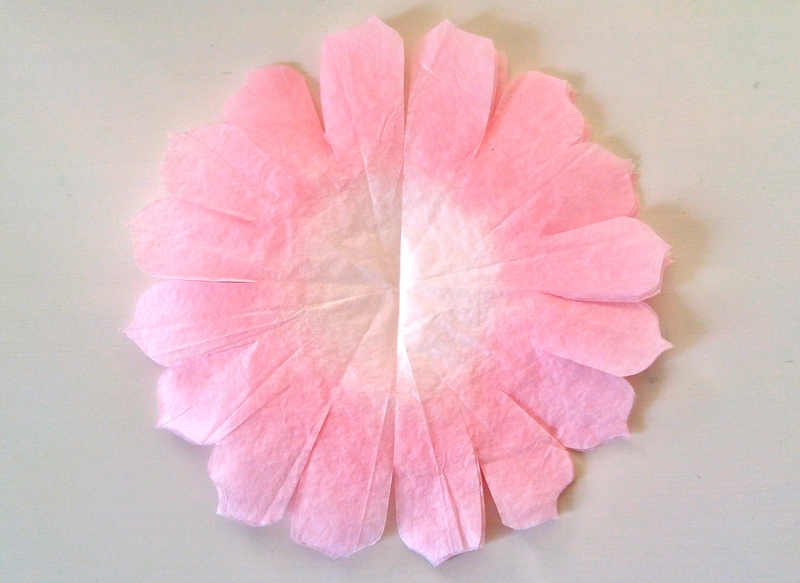 If you dip the edges of the coffee filter, the resulting flower will have tinted tips. 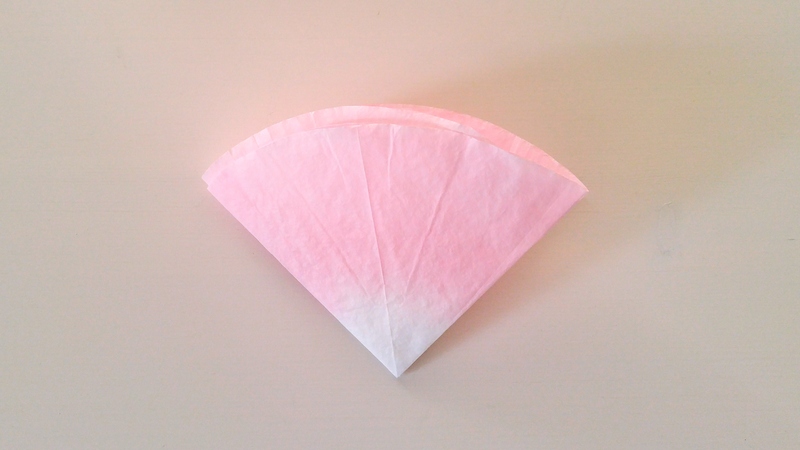 If you dip the centre of the coffee filter, your flower will have a glow of color emenating from the centre. 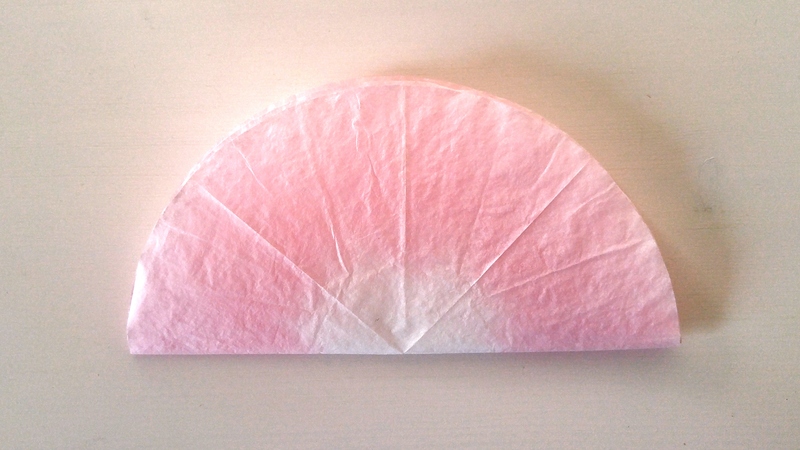 For bonus points, dip the edges and center of your coffee filters in 2 different colors for a gradient effect! Start with stacking 3 coffee filters. You can use more- 5 filters make an extra fluffy flower! 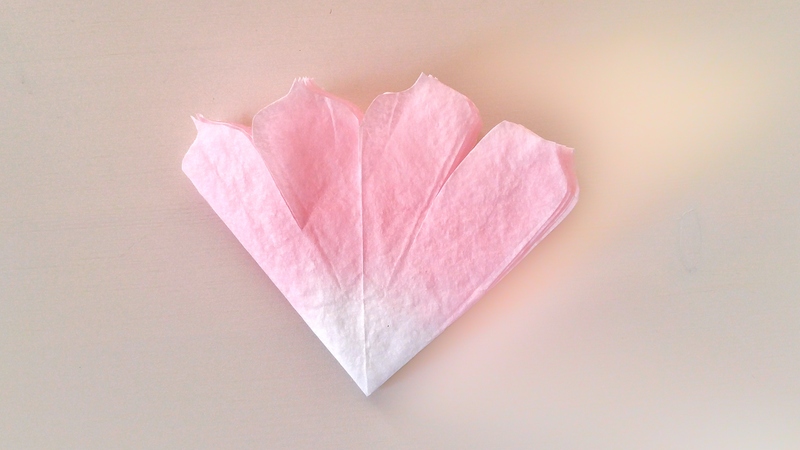 Cut out your petal shapes. 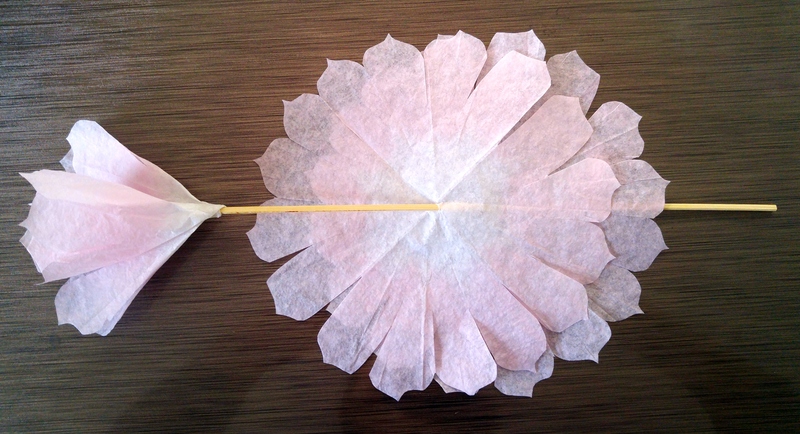 You can try rounded petals, thin and pointy ones, or scalloped edges- each results in a totally different looking flower! 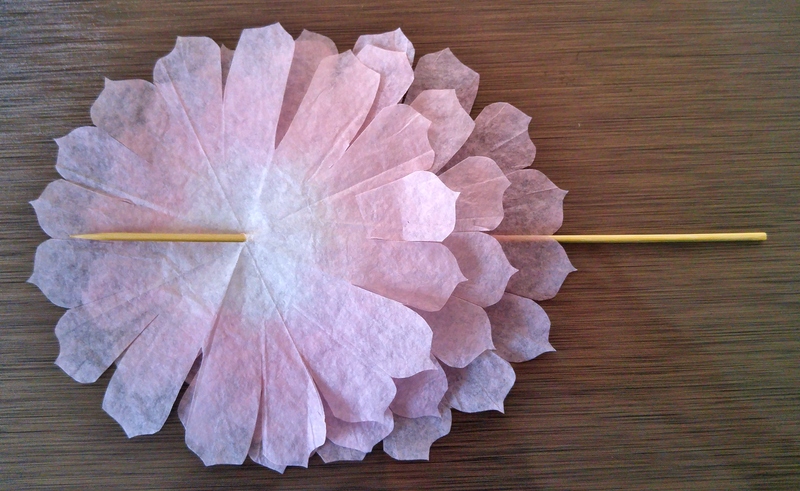 Unfold your filters, keep them stacked, and take a moment to make sure the petals are cut in deeply enough towards the centre. Pierce your skewer through the centre of all filters. They are now loaded and ready to go! Squeeze hot glue on the centre of your top filter, and bunch up the filter to adhere it to the top of your skewer. Repeat this step gluing and layering all your filters. Once all your filters are glues, fluff out your petals and admire your beautiful flower! 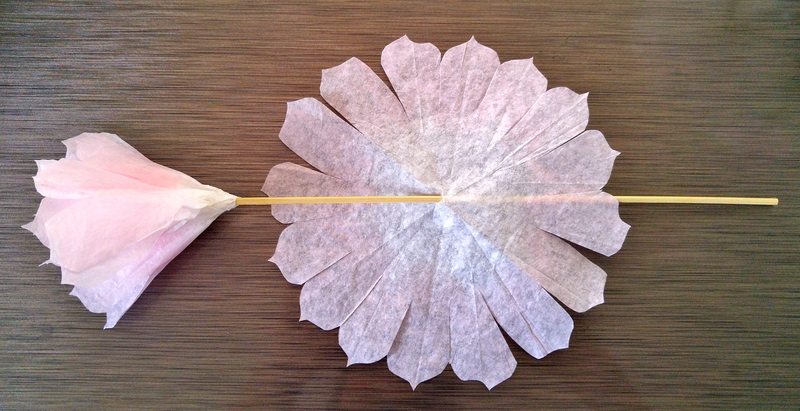 You can finish off your flower by adding silk leaves around the base, or use green ribbon instead. 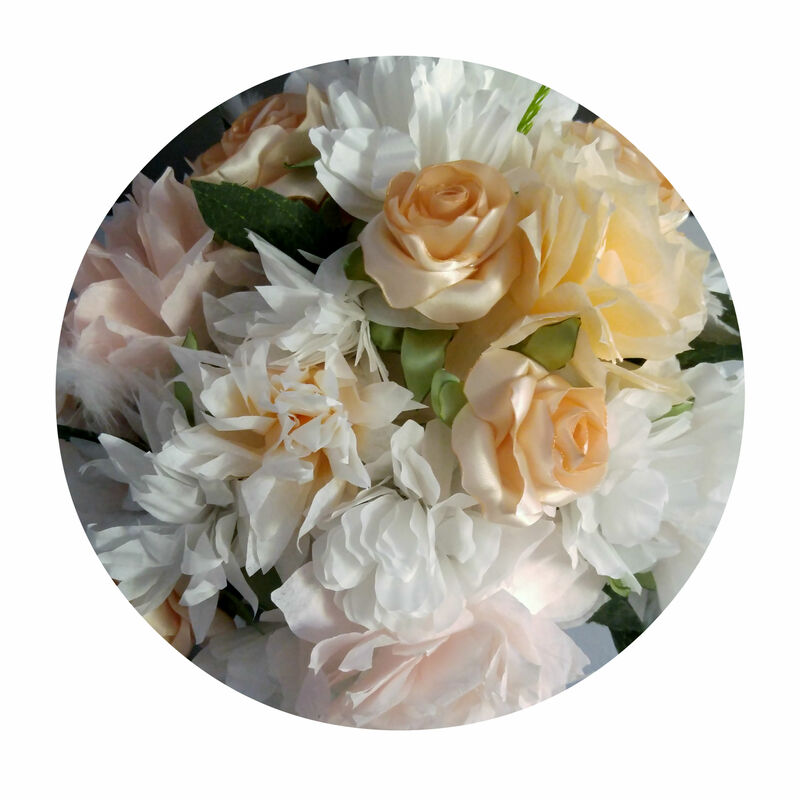 These come together quickly, and you can easily crank out a whole bunch, making them an excellent craft project for wedding décor, like centrepieces or bouquets. Most of the time when I make something, I do so for the sole purpose of meeting a personal need, or satisfying a crafting urge. Maybe I want to try and learn a new technique, or maybe I’m trying to use up some scraps and challenge myself to make something special out of what’s around the house. Sometimes, I make something with the purpose of giving it to someone else. Sometimes I only realize that after an item is complete, or after I owned it for a little while. When I make something it takes some time and effort, so I want to make sure that the person I give it to can appreciate it and put it to good use. What makes a person craft-worthy? Has this ever happened to you- you plan out a project, collect your materials, spend time and effort putting it together, and gift it to someone, only to have them seem unappreciative or dismissive? I will admit, it has happened to me on multiple occasions! To me, a handmade gift trumps a store-bought one hands down. However, not all people see it that way! I have realized that some people see a handmade gift as a cop-out, a cheaper alternative to actually buying something, or an immature gesture. It can be easy to feel offended by their perspective, but a much better approach is to weed out those people and only make things for the people who you know will appreciate your effort and cherish the result. Christmas 2014- I was practicing loom knitting and made myself an infinity scarf, and had multiple compliments on it from family and friends (even without telling them I made it). I then decided to knit infinity scarves for all of the women in my family and friends circle. I got a head start and was able to finish all of them just in time for gift giving. My mom loved hers, and wore it proudly throughout the remainder of winter. My SO’s aunt said it is a nice color, then put it aside and never wore it. Summer 2015- I made an up-cycled beer bottle vase (featured here) and displayed it prominently on our dining table. Every time my friend would come by she would comment how much she liked it, and when I told her I made it she was visibly impressed. She recently moved to a new place, so I decided to make one for her and give it as a housewarming gift, as I know she will appreciate it and enjoy it in her new home. Part of why I started this blog is because I want to share inspiring ideas and projects with the world. Some things are better in writing, but others just make more sense in video. Sooo…. I am planning to use this as an interactive way to do tutorials and DIY’s, and I already have a list going of all the projects I want to share! So tune in soon for more awesome to come! Welcome to Throne and Thimble!